Captain Edward L. Beach won fame as a submarine commander and best-selling author describing life beneath the waves. The son of a career naval officer, Beach was born in Palo Alto, California in 1918. He graduated from the U.S. Naval Academy in 1939 and from Submarine School in 1941. During World War II, he served as Damage Control Assistant, Chief Engineer, and Executive Officer of USS Trigger (SS-237), during which time she was one of the highest scoring submarines in the force. He received the Navy Cross for his service as Executive Officer of USS Tirante (SS-420) in early 1945. 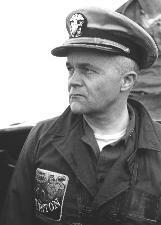 Beach also made one wartime patrol as commanding officer of USS Piper (SS-409). Following the war, he commanded USS Amberjack (SS-522), USS Trigger (SS-564), and USS Triton (SSN-586), and served as naval aide to President Dwight D. Eisenhower. Between February and May 1960, Triton, under Beach's command, made the first submerged circumnavi- gation of the globe. This 83-day voyage proved the ability of nuclear-powered submarines to conduct long-duration operations in any part of the ocean. Beach has also won renown as the author of three submarine novels, including the best selling "Run Silent Run Deep," "Dust on the Sea," and "Cold is the Sea." He also wrote several nonfiction works, including "Submarine," "Around the World Submerged," "Wreck of the Memphis," "The United States Navy: 200 Years," and his autobiography, "Salt and Steel." "When I left Old Sal she had made an excellent re- cord in the Mediterranean, and had received numerous accolades for being the most dependable, best performing oiler there. Our crew, I felt, had developed a certain pride in the ship, and I was sorry to leave them." The papers contained on this site are on file in the Dwight D. Eisenhower Library, Abilene, Kansas, and a copy is displayed at the Salamonie Valley Museum in Warren, Indiana in an annex dedicated to the USS Salamonie. They are identified in both places as "The Beach Papers". They were donated to the Eisenhower Library by Captain Beach and to the Salamonie Valley Museum by the USS Salamonie Association and are some of his personal papers kept during the period of his command from 1957 to 1958. The use of the term "File No." in the left-hand sidebar is for the purpose of establishing small, quickly downloadable files and has no relation to their actual designation in The Beach Papers. to this page since Feb. 7, 2003. Due to the size of the file when scanned into an Adobe pdf file, and to avoid lengthy download times, we are offering only a few pages at a time. The entire file is 100 pages long. To view these pages you need Adobe's Acrobat Reader. If you don't have it installed on your computer, you can download it free-of-charge from www.adobe.com. Extra! Extra! 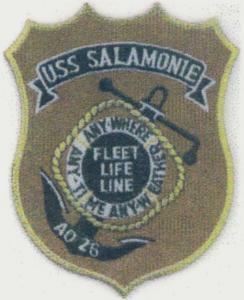 Captain Beach's uniforms and medals to be donated to the USS Salamonie Museum! Click here for pictures. 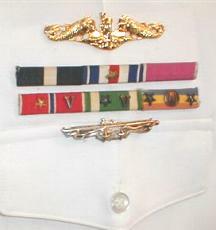 Navy Cross, Silver Star (2 awards) and Legion of Merit w/Combat "V" for valor. Bronze Star (2 awards and "V" for Valor), Navy Commendation Medal (2 awards and "V" for Valor) and Presidential Unit Citation (3 awards). The pin under the ribbons is the Navy Unit Citation signifying successful combat war patrols. 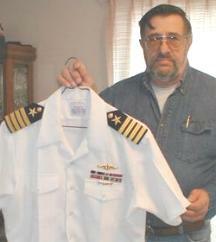 USS Salamonie Association President, John Lichoff, holds up the uniform shirt with ribbons sent to him by Captain Beach's widow.